I'm an admirer Greenhill, both as an exhibiting artist and as an art lover. I've been working on a new series where I use a shadowbox to much more closely control the type and amount of light my still life gets. I'm mid-way through the first painting and the results are interesting. Stay tuned for further developments. I also have work in the upcoming Eye of the Artist exhibition at The Yadkin Cultural Arts Center. Selections were made from over 100 submissions from artists across North Carolina by Winston-Salem's Page H. Laughlin, a painter, who works as a professor of art at Wake Forest University. The opening night event will be held on July 12, 2013 at 5:30 p.m. in the Welborn Gallery in the Cultural Center. With the awards being presented at 6 p.m. This event is free to the public and everyone is encouraged to attend. The Center is located at 226 E. Main St. in Yadkinville. Visit their website for further details. I was honored to be awarded first place in Yadkin Cultural Art Center’s “Eye of the Artist” exhibition, which opened on Friday July 12th. 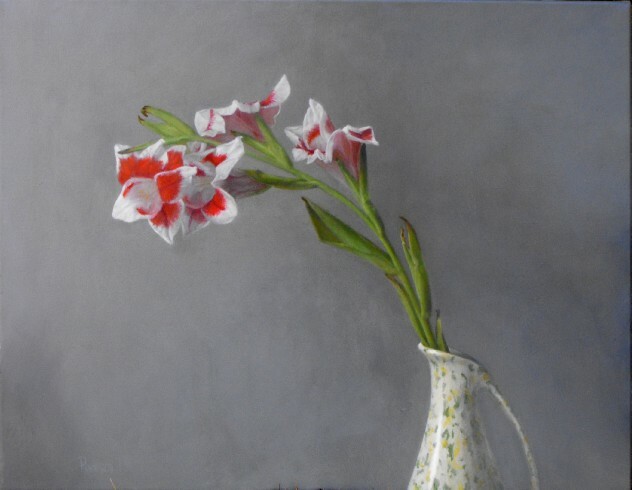 The floral oil painting “Bizar Glad in Speckled Vase” was selected by Paige Laughlin for the top prize, including a cash award of 1500 dollars. Ms. Laughlin is a painter, a professor of art at Wake Forest University in Winston Salem, and a 2007 recipient of a North Carolina Arts Council Fellowship. Over 100 artists across North Carolina competed in this event with the top three artists being recognized in an awards ceremony at the opening reception. The dates for this show are July 12 through August 24, 2013. I am thrilled to be selected for such recognition from a group of such strong work. It is also nice to be recognized by other regional and local artists and so close to my hometown. Bizar Glad in Speckled Vase, Oil on Canvas, 22 x 28"